Metamaterials are a novel class of artificial materials that allow to affect the properties of light by suitably chosen unit cells, called the metaatoms. A rough definition would define metamaterials as structures where the chosen geometry of the unit cells predominantly affect the properties of light. In a narrower definition, we would require that the metaatoms are such small that the light effectively does not probe the isolated elements but rather perceives an effective medium. The properties of this effective medium in turn are dictated by the chosen metaatoms and their arrangement. 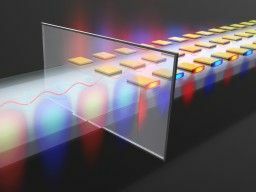 Metamaterials are at the heart of many groundbreaking applications, such as a perfect lens or a cloaking device that can hide objects from an external observer. They also constitute an excellent means to effectively tailor a nonlinear response or to change the local density of electromagnetic states. Presently, we focus in our group on the problem of homogenizing metamaterials, both fabricated with top-down and bottom-up approaches, on exploring novel effects that only came in reach with metamaterials, on studying novel geometries for metaatoms and exploring primary applications.